Arden Siarot's career trajectory wasn’t an easy journey, but his success is a very inspiring story that surprised many, including Arden himself. He was part of Cebu's first wave of subcontractors who capitalized on the province's export boom before starting their own business as direct exporters. Though he didn't like the difficult task of designing, Arden assumed the role so his young company can save on expenses. During those early years, Arden admitted that he didn’t have any direction before finally finding his footing in the world of metalcraft. A collaborative project with Tes Pasola for CITEM’s Design Commune program yielded a dramatic vase with dragons (top left). Shells and metal are Arden’s primary materials, seen in (clockwise from top right) the ivory ostrich egg carried by giant ants, a pair of birds perched on twigs, as well as the dog resting beneath an umbrella. Apart from his intuitive business acumen, Arden’s desire to develop his design and technical skills along with an unwavering commitment to quality paved the way for Arden Classics Inc.’s ultimate success in both foreign and local markets. All these values can be easily acquired over time, but Arden’s disciplined style shaped and solidified his brand’s image. Every item in the self-taught designer’s portfolio demonstrates his command of two primary materials, shell and metal. 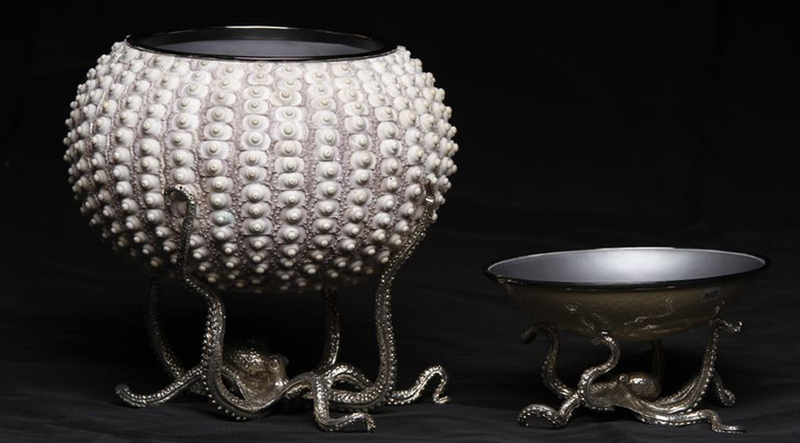 A pair of bowls inspired by sea creatures. Most of all, Arden has become a master storyteller as revealed in his portfolio. An army of ants struggle beneath an ostrich shell commandeered by a delicate dragonfly. Bowls rest on the tentacles of an octopus. A dog awaits his master beneath an umbrella. Dragons clamber for control of a wire vase. A pair of birds caught in a romantic encounter. 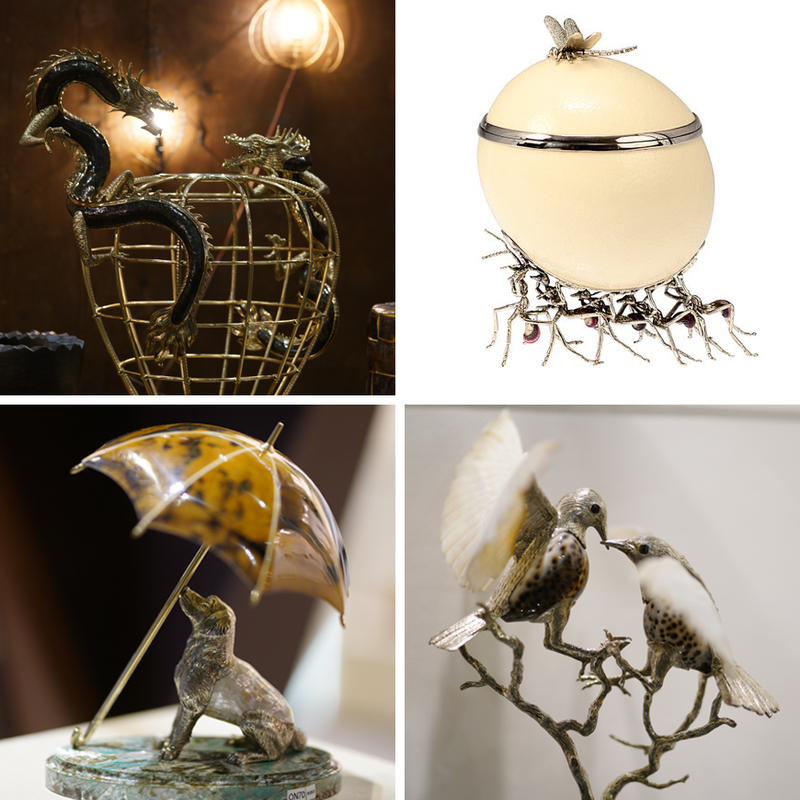 At Manila FAME’s 68th edition, Arden confidently points to an army of Chinese warlords and a pair of lamps abloom with delicate shells, part of his new collections. These remarkable entries display his distinctive design ethos that continue to draw collectors from all over the world. Top photo: Arden Siarot, president and chief designer of Arden Classics Inc.